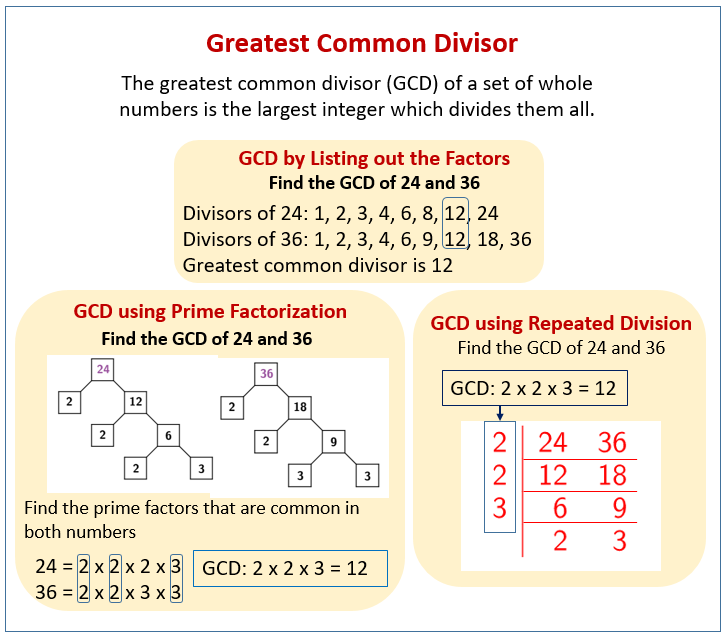 Examples, solutions, and videos that will explain how to find the greatest common divisor (GCD) or greatest common factor (GCF) using the definition, factor tree, repeated division, ladder method, Euclidean Algorithm, . The following diagrams show how to find the greatest common divisor (GCD). Scroll down the page for more examples and solutions on finding the greatest common divisor. Learn the definition of the "greatest common divisor" and solve three examples. How to find the Greatest Common Divisor, using the factor tree method? 1. Find the GCD of 72 and 8. 2. Find the GCD of 76 and 52. How to Find the Greatest Common Divisor by Using the Euclidian Algorithm?